In 2006 Nintendo released the exciting Wii which saw people flinging their arms around and jumping round the room. Then in 2012 Nintendo introduced the Wii U which saw the fun of the Wii and a handheld console all in one. The recently announced Nintendo Switch will be arriving on 3rd of March 2017. The Nintendo switch is a Hybrid video game console comprising of the Switch Console, the switch Dock and the Joy-Con controllers. It is described as a Hybrid but is predominantly a home gaming system. The Nintendo Switch is an upcoming console from the Nintendo family. The main feature of the Switch is its main unit which resembles a tablet computer. The tablet has two detachable controllers which attach to the side of the tablet called Joy-Con’s. 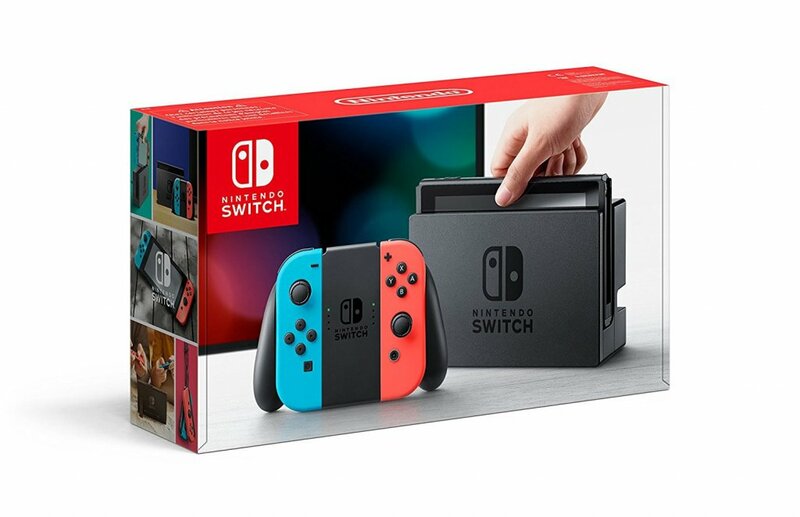 The Nintendo switch comes in two colour options, it has a set that features grey Joy-Con’s and a set that features neon red and neon blue Joy-Con’s. When the Joy-Cons are attached to the Joy-Con grip they act as one complete controller but when they are not connected to the grip they act as two individual controllers. These Joy-Cons can be used one in each hand for a single player or one each for multiplayer. The main has a screen size of 6.2 inches and a 720p multi-touch display and unit slots nicely into a docking station -the Switch Dock. Nintendo switch do not use disks as did the Wii and the Wii U, instead it will use game cartridges that fit into a slot in the back of the tablet. The switch has three play styles, the TV mode, Tabletop mode and handheld mode. The biggest change that comes with the Nintendo Switch is that the Nintendo Switch tablet is portable and easy to take out and about without disrupting your game. You will be able to seamlessly Switch between playing on your TV screen to playing on your small screen, this means that you can start a game at home and carry on playing it when you are out and about. Before with the Wii and the Wii U your console worked while plugged in at home and you were unable to take it out so you were tied to playing at home. Nintendo Switch supports Multiplayer games so you will be able to network your Switch game pads to enable you to play local multiplayer with up to eight players and if you sign up to the Nintendo switch online subscription service you can play against friends all over the world. In addition to the Joy Con controllers you use you can also buy the additional Nintendo Switch pro controller which has HD rumble, motion control and amiibo functionality.